SmallCraftAdvisor.com • View topic - No more boatless! I think so. There is still some life in them and I don't race! Not much life looking at the angle of the boom. Racing or not bad sails is like driving a Yugo that needs a tune-up, has bad shocks and firing only on two cylinders. Quit talking about my car like that! So far I only sailed the boat once and in light wind. The boat was moving along fine upwind. I will simply get a new main if needed. Aft end lower than the gooseneck shows the leech is a mess. The huge bag I can see in the forward and lower half of the sail. It looks well blown out! 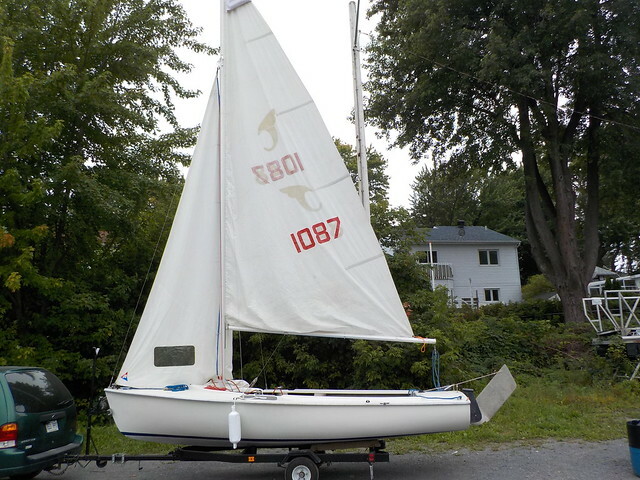 I will surely see how it sails in some more wind the next time I put her in the water. I will roll the sail some bit on the boom (rolling boom) if needed but I may get a brand new main for next season if it really sails bad. I also want to find or make myself a reefing claw. From looking at the photos, I'm thinking the problem might not be the leech but the luff. I would first try to lower the gooseneck and see if that helps. If the gooseneck is as low as can be then a new main is probably in order or maybe you can get it recut for now. You could be right Jacques. After all, it was the first time I was rigging that boat. I was not at home on her like on my Piper! Next time I should make it better.